If you play in any of these tournaments, you might want to enter some smaller events first to develop "tournament toughness," which will help you in the big ones. Here's my Tip of the Week on this, which begins, "Playing in tournaments is quite different from playing practice matches. Here are three reasons for this. 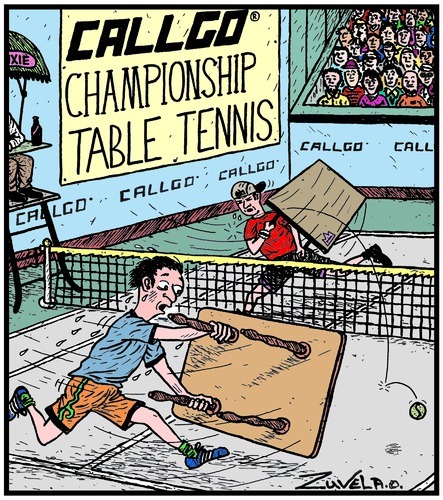 First, the playing conditions are generally different than you are used to - different tables, balls, floors, backgrounds, and lighting. Second, you are usually playing different players, while in practice you often play the same players over and over. And third, there's far more pressure in a tournament match than in a practice match. (There are other, lesser reasons - traveling, time zone changes, eating different foods, etc.)" Here's a rundown of some of the big ones coming along. (To find tournaments, see the USATT Tournament Schedule.) We'll start with three of the BIGGEST ones. I've got a huge conflict here. I'm sponsored by Butterfly, but the JOOLA North American Teams are both local and run by a former junior star from my club, Richard Lee. (Richard won nearly every age event at the Junior Nationals and Junior Olympics during his heydays in the 1990s - and though I wasn't his primary coach, I spent hundreds of hours practicing and playing with him.) Richard still comes to MDTTC, and his son, 7-year-old Ryan, is now one of our up-and-coming juniors. Here are the two tournaments. The $3000 Butterfly Teams are held in Hobart, IN. Here's their promotional video (2:07). Tournament director is Dan Seemiller. They are the "new kid on the block," running their own 4-star team tournament on the same weekend as the traditional North American Teams. If they are successful, I'm guessing they will increase the prize money in the future. The $20,000 JOOLA North American Teams are held in Washington DC, about 20 miles or so from my club (MDTTC). Here's their promotional video (54 sec). This is the bigger of the two by far, with 140 tables and 830 players last year, the most of any USA tournament. I've been going to this one since 1976. (It was in Detroit back then, moving to Baltimore in 1998, and to Washington DC last year. I was the original instigator in bringing it to Baltimore, along with Richard Lee, Jim McQueen, and others.) They'll be using the new JOOLA 40+ plastic balls at the tournament. I'll be coaching my students at this tournament. Dec. 16-20 - the 5-star $31,000 USA Nationals in Las Vegas. This is one of USATT's two showcase events. (The other is the U.S. Open in July.) I'll be there mostly coaching and attending some meetings, though I'm also playing in a few hardbat events. (I normally use sponge.) The deadline to enter the tournament without a late fee was originally today, with a $75 late fee until Oct. 27, and then no more entries accepted. But they just extended the deadline - they do this every year - and now the first deadline is Oct. 31, with entries accepted with the $75 late fee until Nov. 10. You can actually watch as the entries come in, either by name or by event. They currently have 388, but will have about double that before entries close. (For some reason they don't advertise the total prize money, so I painstakingly added it all up, and it came to $30,650, which I rounded up to $31,000 above.) They'll be using the new Nittaku 40+ Premium ball at the tournament. Here are other upcoming 4-star tournaments. Note they are now running monthly 4-star events at the clubs in Westchester TTC (NY) and Triangle TTC (NC). Oct. 17-19 - $10,000 North Carolina Open at the Triangle TTC in Morrisville, NC. It might be too late to enter this one, since it starts today, but who knows? Oct 25-26 - $7000 Westchester October Open at the Westchester TTC in Westchester, NY. (It's actually in Pleasantville, NY, which is in Westchester County, but I like saying "Westchester.") They run a monthly 4-star tournament at Westchester, so I hope lots of players will support this. I wish I could bring players and attend more of their tournaments (as a coach), but I'm too buy on weekends to get away too often. Nov. 15-16 - $5000 Triangle November Open - another big one at the Triangle TTC in Morrisville, NC. I'll have to get down to one of their tournaments sometime. Nov. 22-23 - $7000 Westchester November Open - another big one at the Westchester TTC. The entry form for this one doesn't seem to be up, but info is at the club's web page. Dec. 6-7 - $5000 Triangle December Open - still another big one at the Triangle TTC in Morrisville, NC. Dec. 27-28 - $7000 Westchester December Open - still another big one at the Westchester TTC. Here's the video (1:53) between USA's Kanak Jha and Sweden's Kristian Karlsson. Here's the interview, which covers his table tennis (player and coach), cycling, and other subjects. Here's the ITTF Press Release. Here's the ITTF Home Page for the event (with articles, results, and soon pictures and video), which runs in Linz, Austria, Oct. 17-19 (Fri-Sun). Here's the feature article in the LA Times. Here's their blog page, with the link the "Best Backhands" item (which includes video) and two previous blog items on "7 Things You Need To Know to Master The New Plastic Ball" and "Top 5 Blades You Want Right Now!" Here's video (15 sec) of what training looks like from the world #10 and #1 Korean woman. Here they are! Up to 16GB size. Here's the repeating GIF image. Here's the cartoon! Here's a similar one with the same idea. As usual, my main frustration with USATT is not what's in the minutes, but what's not in them. There's nothing in there about increasing the USATT membership base of 8-9,000 (basically a round-off error for most sports memberships, and for table tennis in most other countries), which is the source of most of our problems, i.e. lack of revenue. Besides the increase in revenue, large membership should be a goal itself, but few from USATT seem interested in this, for reasons I still don't understand. Membership growth comes primarily from leagues, and from junior training programs and coaching development. I'm sure the other issues are important, but they are dwarfed by the need to focus on growth, but it's not even on USATT's radar, alas. Anyway, here are some items I found and my commentary. "While USATT places equipment and product suppliers on USATT’s approved list, use of USATT’s logo on this equipment has not been approved. Suppliers should be contacted informing them that USATT approval is restricted to usage of their equipment and/or products in USATT events." This seemed strange and unfair. Companies pay a lot of money to have their products USATT approved. Note that USATT doesn't even test them - ITTF does that at no cost to USATT. So these companies are paying money directly to USATT just to have them approve their equipment for USATT tournaments. And now they are going to be told that, even after getting USATT approval, they can't advertise these USATT-approved products with the USATT logo? I don't think that's fair. A USATT-approved product should be allowed to advertise this status with the USATT logo. "The digital magazine generated $9000 in ad revenue for the Spring 2014 issue, constituting a $6,000 shortfall to budgeted revenue." In my blog on February 11, 2014 on the cancellation of the print magazine and going digital, "But they'll lose money on advertising and membership." I also wrote, "I'm told they are budgeting advertising to stay the same, which of course won't happen." As verified here, they really did budget $15,000 in advertising for the issue (which is what was budgeted for print), expecting to get the same ad revenue with an online magazine as a print magazine. There was no chance of that happening, and yet they convinced themselves of this. And so they lost $6000 ad revenue in the issue, and presumably $36,000 over the course of a year. I'm guessing that some advertisers stuck with it for now, but will cancel or decrease their advertising later - we'll see. Eventually we'll reach a new rough status quo on advertising at a level considerably lower than before. As noted in my blog, they do save money now on printing and postage. The amount they save in that way would be roughly offset if they simply had kept the print magazine while also going digital, thereby increasing the value of their advertising, and thereby increasing it. As I also wrote in that blog: "This reminds me of the group-think that took place a number of years ago when USATT increased the membership fee from $25 to $40 in one year. I was in the room as the 13 board members voted unanimously to do this, and unanimously budgeted membership to stay the same. That was crazy, and I told them so. Membership had just reached 9000, the most ever. I predicted they'd lose 2000 members; I was told by all 13 that I was wrong. One year later they were down to 7200 members. I was in the room one year later, alternating between anger and laughter, as the USATT board had to painstakingly cut about $60,000 from the budget." However, it was recommended that the celluloid ball continue to be used at the upcoming U.S. Open and Nationals. This might be a good thing as I don't think many people have the new balls yet. It's even more problematic for the many full-time clubs and junior programs that use large quantities of training balls (for private and group coaching, and lots of multiball), since they are all currently celluloid. Do we have to toss them out and buy new poly training balls? Will they be available anytime soon at the same inexpensive price of training balls? I only know of 3-star balls so far. I hope we aren't ever going to be stuck with using 3-star poly balls in major tournaments but only celluloid training balls. You don't want to train with one if the other is what is used in tournaments - they play somewhat differently. Please, USATT, do not make the change until poly balls are widely available and affordable both in 3-star and training-ball formats. Here's the new coaching article from Brian Pace, with lots of pictures and links to videos. Here's video (3:12) of the world #4 German star serves in slow motion. Here's an article in yesterday's New York Times on the topic. Here's the study in Psychological Science that much of the article is based on. Former USATT President Sheri Pittman Cioroslan is doing an article every day during the last 100 days of Adham Sharara's ITTF presidency, counting downwards from 100. Previous ones are linked from the USATT News page, as well as in my past blogs. Fifty-three down, 47 to go! Here's a new highlights video (1:39) on the recent World Team Championships in Tokyo, set to music. Here's the article and video (2:28) for our Chinese readers. It's apparently about her hopes for a medal at the upcoming Youth Olympics. One of the most common problems with beginners is they don't rotate their shoulders on the forehand. Several players have this problem in beginning/intermediate class I teach on Monday nights. Even when they learn to rotate the shoulders when hitting forehand to forehand or in multiball they tend to fall back on arm only (i.e. no shoulder rotation) when doing footwork. The solution I've found is to emphasize the rod-through-the-head coaching technique. When you hit or loop a forehand, imagine a vertical rod going through the top of your head, and rotate around the rod. In reality, the head normally moves a little forward doing the stroke from the back-to-front leg weight transfer, but often very little is needed since most of power comes from torque, as the body rotates in a circle. So for beginners especially it's important for them to focus on this idea of rotating their shoulders around this rod through their head. This gives them the right feel of the shot, and something to focus on to fix the shoulder rotation problem - and when they do footwork drills, it tends to stick with them and they continue to rotate the shoulders properly. After hobbling about on Friday after hurting my knee on Thursday night while demonstrating forehand looping for a class, it got better over the weekend. So I probably only wrenched it. I can still feel a slight strain there, and will go easy for a time, but it's mostly okay. Here's a preview (2:35) of Brian Pace's new video. Here's the video (7:26) from PingSkills. Here's a nice video (1:12) that demonstrates the serve, using slow motion and a colored ball so you can see the spin. St. Louis Open Hopes to Set Example with U.S. Citizens Only "Elite Event"
Here's the article. It's "…taken Australia by storm"! Don't you love Xu Xin's shirt? Here's the video (3:55) of this anime cartoon. It's in Chinese, with English subtitles. Here's a video (3 min) from five years ago where Waldner beats a TV host with various implements as a racket before finally losing with a banana! I believe it's in Swedish, but you can follow what's going on. It was a busy weekend of coaching, though strangely not as busy as usual as I had Sunday morning off for a change, due to a pair of out-of-town students. However, that was offset by our one-day camp on Friday, where I coached from 10AM to 6PM. Schools were closed that day for "Professional Day." We had another snowstorm on Sunday afternoon, with about 2-3 inches here in Germantown - enough is enough!!! It's been "Spring" for eleven days now. (Hmmm . . . "days now" is one space away from "day snow," which is what happened yesterday.) I'm personally contacting the beings responsible and putting a stop to this. There will be no more snow here in Maryland until December. Here's a funny incident that took place during the Friday camp. I called a bunch of the beginning kids together to teach them how to serve. My first question to the seven in the group (ages 6-9) was, "How many of you know how to serve?" Nearly all of them raised their hands. So I asked for volunteers to show how to serve. I wish I had a video of what followed as we got sort of a who's who for every stereotypical illegal basement serve possible!!! One kid did the typical basement serve where he bounced the ball on the table and then hit it directly over the net. One kid reached way over the table to get as close to the net as he could to serve. One simply tossed the ball up and hit it directly to the other side of the table. All but one of them grabbed the ball with their fingertips. Only one of the kids knew how to actually serve somewhat legal - he'd come to a few of my group sessions - but even he didn't come to a complete stop, cupped his hand severely, and hit the ball in front of the end-line. I'm not picky about the serving rules with beginning kids, so the main focus after this was to get them to serve just roughly legal. I didn't enforce the ball in the palm of the hand, as younger kids have trouble with that, and if contact was sometimes made an inch over the table, so be it. They'll learn better as they play more. For now, I just wanted them to be able to get the ball in play, which is surprisingly difficult for younger kids when they first start out. I brought out the colored soccer balls so they could see the spin I was putting on the balls, and had them try to spin the balls off their rackets for practice. At this point they all wanted to learn to put spin on their serves, and even the ones who had never served before were soon trying to serve with backspin - and all of them got at least a semblance of spin on their serves. A few also spent time trying to serve fast serves. 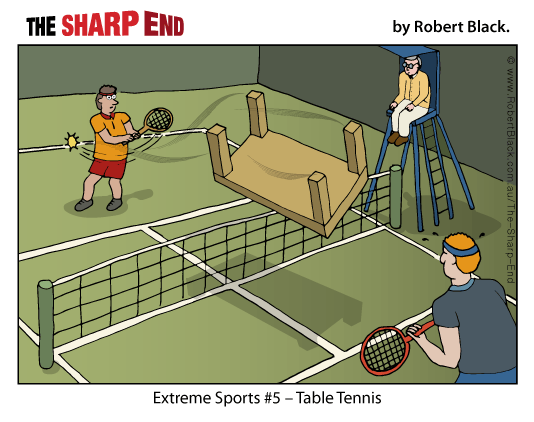 My new book, "Table Tennis Tips," will be out by the end of April. It's a compilation of all 150 Tips of the Week I wrote every Monday from January 2011 to December 2013, organized in logical progression. It's basically done, both the text and covers, but it's being proofed by a few people before I finalize it. Here's a new video (2:04) that previews Brian Pace's new upcoming video, Tournament Table Tennis. The preview, which has some nice comparisons to martial arts, starts off with a compilation of some scary forehand loops by Brian, and then highlights the techniques used with spoken quotes from Bruce Lee. Jim Butler, who has gone from table tennis star to muscle expert to video expert (and still a table tennis star - he made the U.S. team again!) put together highlight videos for all eight players who qualified for the USA Team at the USA Team Trials. They are all linked (along with lots of other videos) at the USA Table Tennis Video page. Included are videos featuring Lily Zhang, Prachi Jha, Crystal Wang, Erica Wu, Timothy Wang, Adam Hugh, Yahao Zhang, and Jim Butler. There's also a 2014 US World's Men's Team Highlights video (14:25). Here's the video (1:07) of this great point. Here's video (1:41) of Sean O'Neill's daughter Kaitlyn in training, set to the Oscar-winning song "Let it Go." Most impressive thing to me as a coach: she keeps her free hand up, allowing balance, which leads to easier moving as well as shoulder turn on the forehand. This is one of those little things that younger kids have trouble doing unless you keep reminding them. Oh, and the thumbs up at the end of each segment was nice! Here's the article on a pair of 13-year-olds from Japan that won Women's Doubles at the German Open (Mima Ito and Miu Hirano). The picture of their faces was taken when they were told they had won $5000. 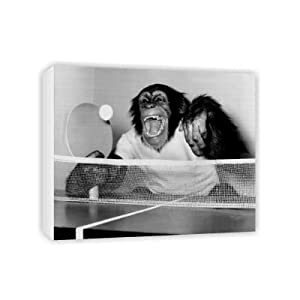 Here's an article in the Washington Post on Mankoff that features his love for table tennis. Here's the opening paragraph: "Bob Mankoff does more than like ping-pong. He is a man in efficient and focused motion as his paddle smacks each reply with the precision of a punch line. Bap. A forehand sharp as a verbal half-volley. Boop. A backhanded ball cut as thin as a slice-of-life joke. Bam. The clean put-away that requires an almost silly degree of exertion on what he says is a laughably small field of play. But then, this is what Mankoff has been doing most of his comedic career, too: Creating inventive angles and sly spins and rhythmic tricks with relentless attention to detail, as if necessity were the Jewish mother of invention." Remember the double-bladed light saber used by Darth Maul in Star Wars 1? (Hey, forget about Jar Binks already!) 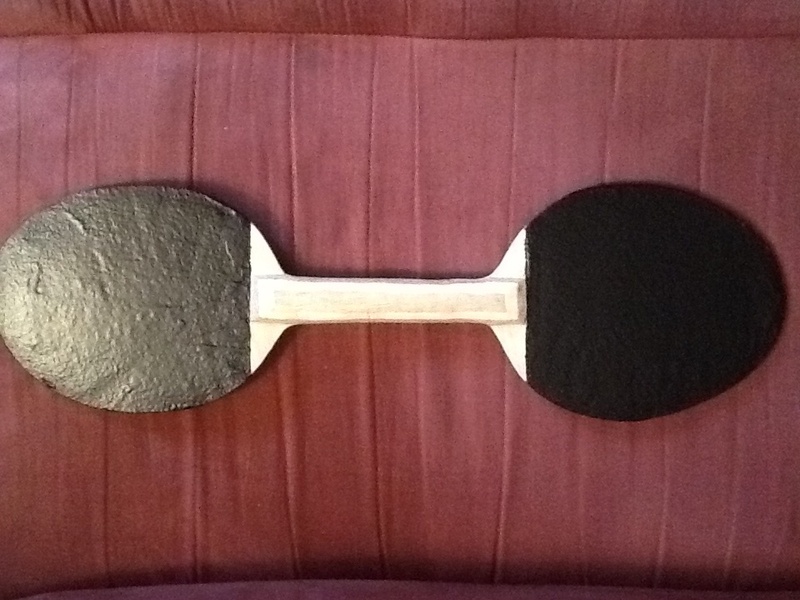 Well, here's a double-bladed ping-pong paddle! I want one…. Of course once they are into a counterlooping duel, the incoming counterloop usually has sidespin, and if you counterloop it back with sidespin (assuming both are contacting the ball on the far side), you are taking on the incoming sidespin directly. But that's not much of a problem because by doing so it becomes trickier controlling the sideways movement of the ball, just as taking on the topspin directly makes controlling the up-down movement of the ball more difficult. But you have a much wider margin for error with sideways movement; few players miss because they go too wide, while many miss by going off the end. You actually get a bit more topspin when going directly against the incoming topspin, where the ball rebounds back with topspin, if you can control it. The same is true against an incoming loop with sidespin and topspin - if you go directly against the incoming spin and loop back with your own sidespin and topspin, you get a bit more spin overall. (And that is one reason why in counterlooping rallies both players continue to sidespin loop.) However, the difference here is minimal as players are often throwing themselves into each shot, thereby getting tremendous spins regardless of the incoming spin. When the backhand banana flip, you face the opposite. (Side note - I call it a backhand banana flip for clarity, even though there is no corresponding forehand banana flip.) Against a heavy backspin ball, it's difficult to lift the ball with heavy topspin and keep it on the table. The table is in the way, and so you can't really backswing down as you would when doing a normal loop against a deeper backspin. The banana flip solves this problem by having the player spin the ball with both sidespin and topspin. Contact is more sideways, which makes lifting much easier as you are no longer going directly against the backspin. Intuitively this doesn't seem to make sense to a lot of people until they try it out, and discover how much easier it is to flip the ball, often with good pace as well as good spin (both topspin and sidespin). Some players face the same thing when looping against deeper backspins - they have trouble lifting the ball. This is mostly a technique problem. However, some top players do sidespin loop against heavy backspin, which makes it easier to lift. Jan-Ove Waldner was notorious for this, often sidespin looping over and over against choppers until they gave him one to loop kill. But the difference here is that you have room to backswing, and so you can actually use the backspin to create your own topspin. Sometimes you want to go against the spin. For example, when pushing it's easier to load up the backspin against an incoming heavy backspin as you can use that backspin to catapult the reverse spin back, giving you an extra heavy backspin. You get a lot more backspin when pushing against incoming backspin than you do against an incoming no-spin ball. And with a banana flip, against a topspin serve it's easy to go against the spin by contacting the ball nearly on top, using the incoming topspin to rebound off your racket to give you an extra heavy topspin. Yesterday I made the mistake of teaching a 7-year-old how to tell time. He was used to digital, and had no idea what the various hands on the clock meant. So I taught him. He not only was fascinated by this, but the rest of the session he became a clock-watcher. He didn't completely get the idea, and kept running over to the clock and trying to figure out the time (usually getting it wrong). I tried to convince him that time slows down if you keep watching the clock, but to no avail. This was the second time I've made this mistake - I taught another kid the same age how to tell time sometime last year, with the same result. Never again!!! There are a number of new coaching articles up on the news section of his web page. Here's a video (5:28) about table tennis coach and cyclist Brian Pace's new book, Juicing for Athletes. Here's the video (45 sec) of Prince on the TV show New Girl, which includes a segment where he plays table tennis. Here's an ad (32 sec) for Sony TV that features Justin Timberlake (on right) and Peyton Manning playing table tennis. A (Ping-Pong) Table for Two? I've now seen all nine movies nominated for Best Picture for the Academy Awards. Here's my personal ranking and short analysis of each. Note that all nine were good, so finishing last here merely makes the picture one of the best of the year. I'm pretty sure my #1 will win best picture. 12 Years a Slave: Will and should win Best Picture. Brought something new to the screen: slavery as seen by someone who, like us, learns about it as he experiences it. Pretty brutal movie. Gravity: Also brought something new to the screen: the experience of being in space. One of the few movies you really should see in 3-D. It reminded me of Jurassic Park. Both are examples of "special effects movies" that also have good stories and good acting. Along with "American Hustle," has a chance to challenge "12 Years a Slave" for best picture. Captain Phillips: Great performance by Tom Hanks, great drama. Rather than demonize the bad guys, shows it from their point of view as well so you see why they did what they did. Philomena: Surprisingly good. I went in thinking this would be a somewhat boring movie, but it got better and better as it went along. When I see old pictures of people I almost immediately wonder what happened to them, and so this movie was almost an extension of that as the main character tries to find out what happened to her long-lost son. It got even more interesting when we find out what happened to him, and she tries to learn more about him. The Wolf of Wall Street: Fun movie. We all know about the extravagances of Wall Street, so it didn't really add to that. A little long for the story. Dallas Buyers Club: This was a tough one to rank. Ultimately it came out toward the bottom because I could never like the main character. He started out as a ridiculous redneck character because he was surrounded by ridiculous redneck characters. Then he changes because he's now around new types of people, and begins to take on their traits. So he's basically just becoming whoever is around him. Not much of a thinker. Her: A bit long and slow at times. Nice concept. American Hustle: Entertaining, but didn't have the substance of some of the others. Surprisingly, this is the main challenger to "12 Years a Slave" for best picture, and it has a chance.